One of those worst kept secrets: my holiday back in Los Angeles. 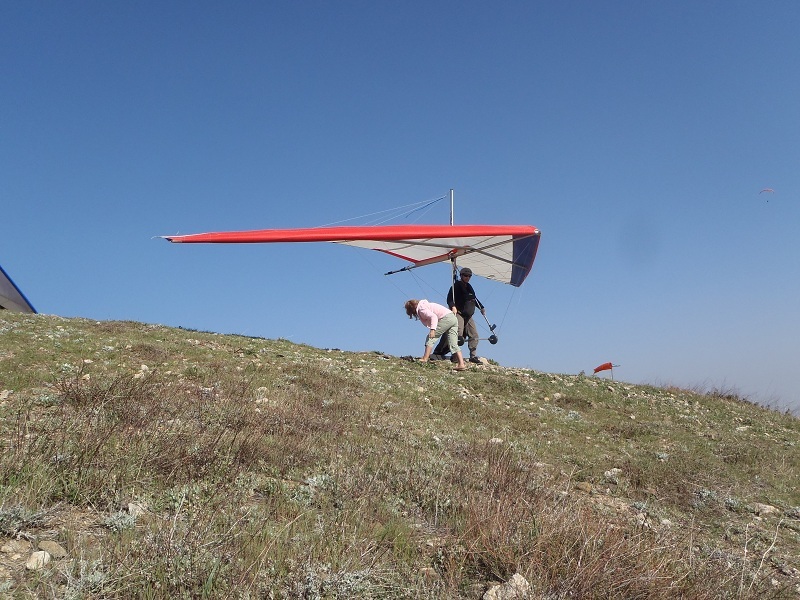 Apparently if you show up to the right people, they’ll rent you a glider for 50 bucks and drive you up to the top of a big hill for another 10 — even if the last time you flew was about 14 years ago. It’s like riding a bike. You never forget. What freaked me most was I seemed to have no fear on take-off. Maybe it was the surprise of going out on the big hill at no notice, when I believed that at the very least I deserved a couple of runs down the dusty old training hill. Somewhere in my brain the fossil records of about two or three hundred flying hours in England in generally atrocious conditions came back to life. The glider was a Falcon (extremely easy training glider), and the landing field was a unique custom built number that looks like an elongated pyramid. Oh my goodness. I had about 2 hours of desperately dehydrated flight on Wednesday, then a very scary benighted drive back to Santa Monica in crazy traffic all over those crowded Los Angeles concrete rollercoasters with a stinking headache. My shoulders and neck were very sore and I did not get even one wink of sleep overnight. Now, a wise person would have quit while ahead, having done the deed and got away with it. I was, briefly, that wise person, until someone pointed out that now I was safe, because my experience was current. No excuses. So I got out of bed at 6am on Thursday, made sure to drink a heavy cup of coffee with lots of caffeine (which I failed to do the day before), put in 6 hours of diligent webscraping work (minus walking to the other end of town to purchase a much needed pair of cheap sunglasses from the bike rental station), and went for day two. The sea breeze was had blown in from the coast and changed the conditions. 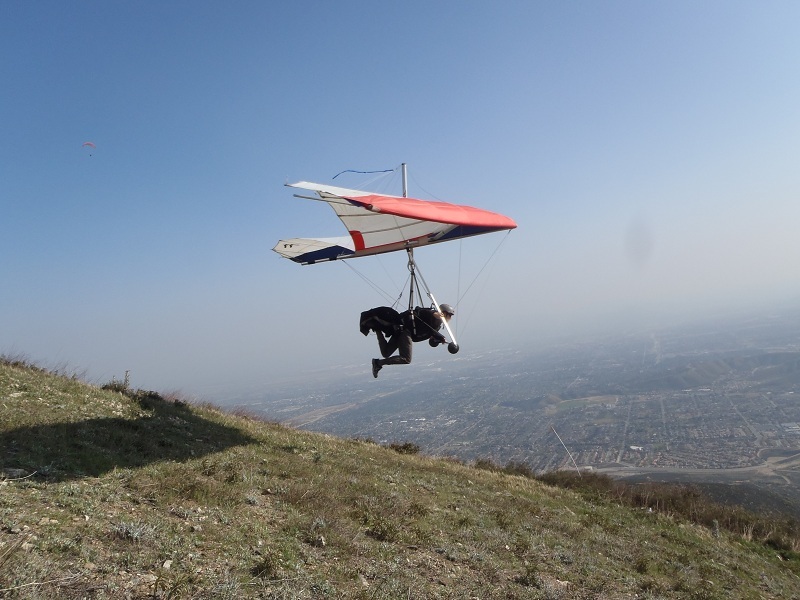 It was quite windy and the thermic lift was less available in the heavy LA smog, which meant I came down after only an hour. But the harness was hung lower, which made flying a dream, and I wore shoes instead of walking boots, so the harness actually fitted me. It was lovely. Given the choice between this and diving or caving as a way of life, I’d stick with the latter two (as I have done). You can do them with friends and, well, it’s obvious that they encompass a much deeper process of discovery and story making — if you refer to Cousteau’s The Silent World (1956), or Norbert Casteret’s Ten Years Under the Earth (1938). 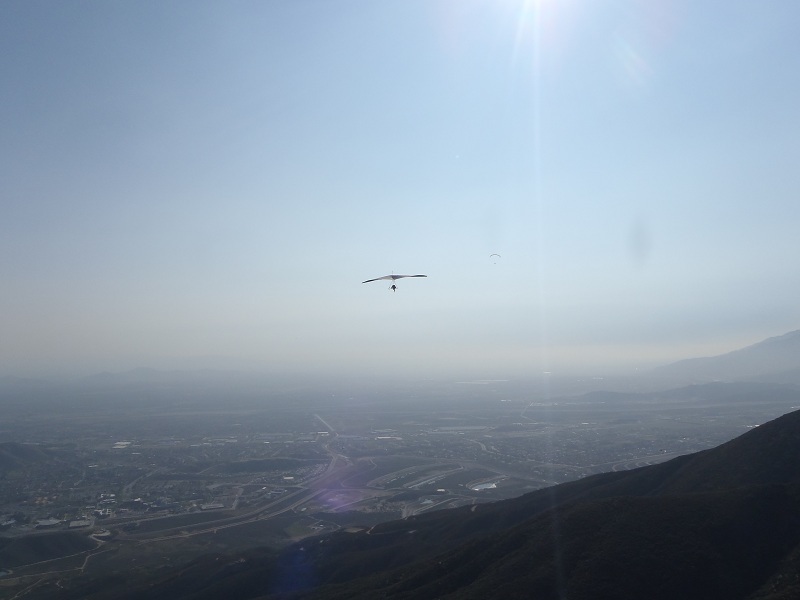 No such seminal works exist for hang-gliding. You have to be there. You can’t talk about it. 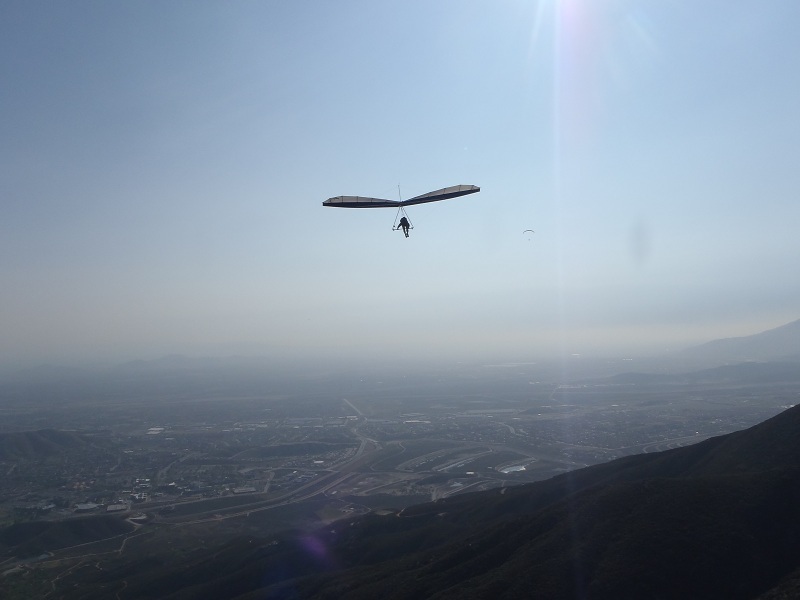 It’s also the reason why hang-gliding is probably safer than the other two. I mean, what could possibly go wrong? I’m not going to get flooded in, drowned, trapped by a rock-fall, swept out to sea, have my lungs explode, or experience a rope breakage because it cut against a sharp rock buried in the mud on a 100m deep shaft and was only 9mm thick because anything with a greater safety margin would be too heavy to carry through 2kms of tortuous passage. So, when can I go again?